Rdio was a streaming music service offering users to listen to ad-supported music for free and play ad-free songs and radios offline in more than 80 countries, like US, Germany, Australia, Canada, etc. It featured with Rdio web player and is available for app in mobile devices, like Android, Blackberry, Windows Phone, and iOS mobile devices. With Radio streaming music app, you could stream and download music from Rdio for offline listening. But on November 22, 2015, Rdio has shutdown its streaming service because of the acquisition by Pandora. Don't want to loss Rdio music and like to download all Rdio songs so that you can listen to favorite music streams after switching to another streaming music service. Take it easy! In this article, we will tell you the easiest way to download Rdio music and then you can transfer Rdio music downloads to any device, music player, etc. for playback. There are so many streaming music downloaders and recorders that allows users to download and capture music from Rdio and other platforms offline. But it could be a difficult task to choose the most suitable Rdio music downloader via one-by-one test. To get rid of this hassle, we have already downloaded the top 6 best streaming music recorders to make the detailed comparison among audio quality, special features, output formats, etc. By comparison, we have picked the best Radio free music download tool, called AudFree Audio Capture for Rdio. 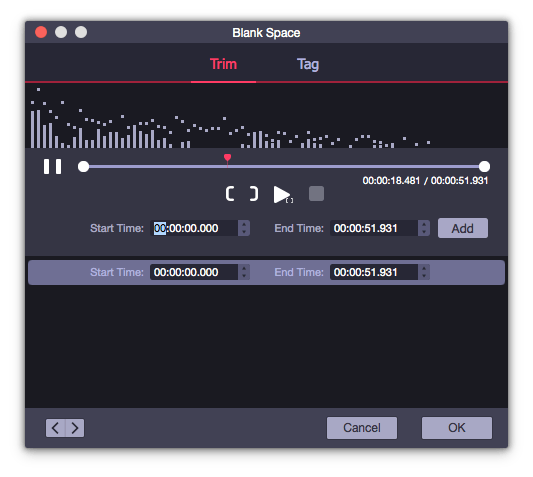 With built-in advanced audio capturing technology, it can record any sound from Rdio playing on your computer with high quality and ID3 tags kept. Besides, it's full-featured audio converter since this Rdio music downloader can save recorded Rdio music as MP3, FLAC, WAV, AAC, M4A, etc. 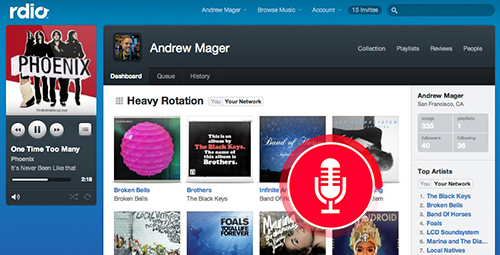 for transferring Rdio songs to any other streaming music services or devices for playback. 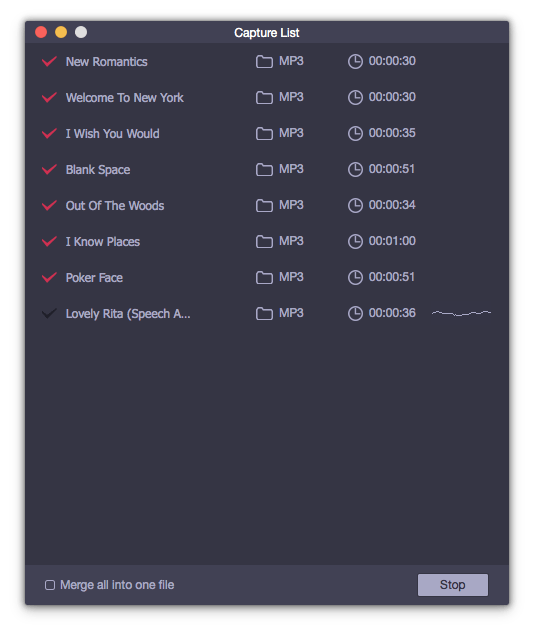 Convert recorded Rdio music to MP3, AAC, WAV, etc. 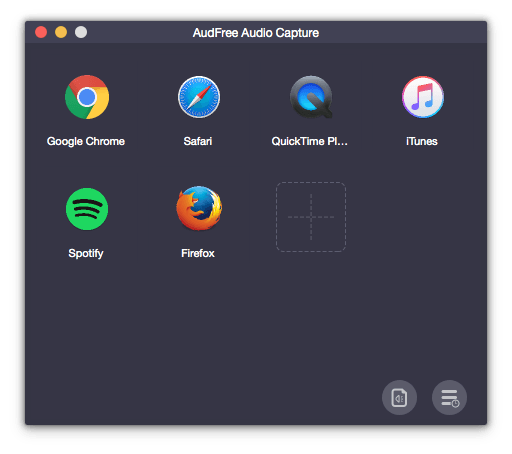 To get music on Rdio by using AudFree Audio Capture, please download and install it on your Mac or Windows computer. And then you can refer to the following tutorial to record Rdio music with ease. 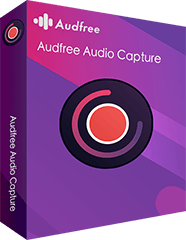 The following tutorial will show you how to use AudFree Audio Capture to record YouTube audios and save the music tracks as MP3 step by step. When you launch AudFree Audio Capture, this main interface will show up, in which you can see programs installed on your computer are listed. You need to check whether the web browser you used to access to Rdio web player is here. If not, please click the '+' button to add it or drag and drop it from computer desktop to the main window. Before downloading music from Rdio, you can personalize the output audio parameters so that you can get recorded Rdio music tracks that you can listen to them on your device and player. Just click the 'audio' icon at the bottom-right corner, and then you can define output format as MP3, FLAC, etc. and customize output quality by changing bit rate, sample rate, etc. Please go back to the main interface, and hit on the icon of web browser to launch it. 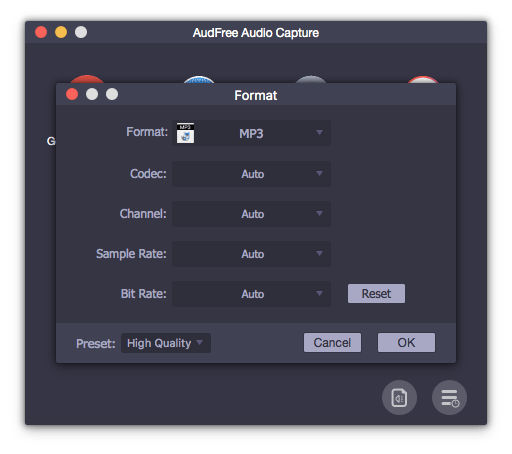 AudFree Audio Capture will launch its recording mode simultaneously. Now you can navigate to the Rdio website and play Rdio music that you'd like to download, the record will start to capture and grab playing Rdio music and divide them into independent tracks intelligently. When all music files are downloaded completely, you can press the 'edit' icon at each recorded track to edit Rdio music, such as cutting them into smaller audio clips, customizing ID3 tags, etc. before exporting Rdio music recordings. After that, you can tap the 'Stop' > 'Save' button to save all Rdio songs to your computer. Since Rdio closed now, you need to switch to other music platforms, like Apple Music, Spotify, Pandora, etc. Speaking of moving from Rdio to others, the first thing you need to worry about is how to transfer your Rdio music. As a matter of fact, Rdio released an official export tool, which is able to export your Rdio downloads, playlists, favorites in .zip files for syncing. Here, we will take Spotify as example to show you how to move your Rdio music collection to Spotify. You also need to get help from another tool, called Spotify Rdio Importer, which can finish this syncing process with ease. Let's see how it works. Step 1. Please launch your web browser and enter to Spotify Rdio Importer website and upload the .zip files exported by Rdio into the outlined box. Step 2. It will require you to login your Spotify account details. 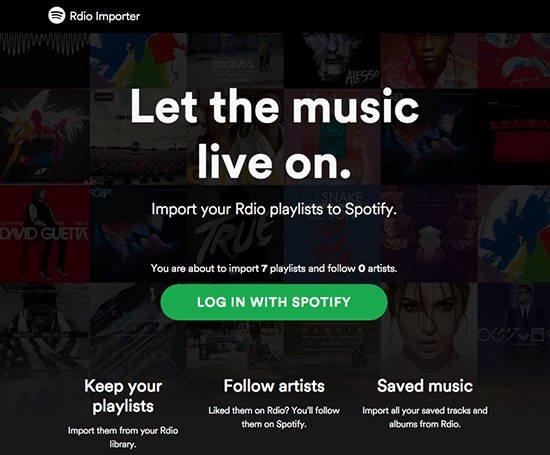 After that, your Spotify account will connect with Spotify Importer. Step 3. Now, you can start to launch Spotify app and you will see Rdio music files will show up in the 'Playlist' section from the left menu bar. Just listen to Rdio music on Spotify without limit. Apart from using the above way, you can also use AudFree Audio Capture to download Rdio music and refer to How to Add Local Files to Spotify source page to move Rdio songs to Spotify for playback.